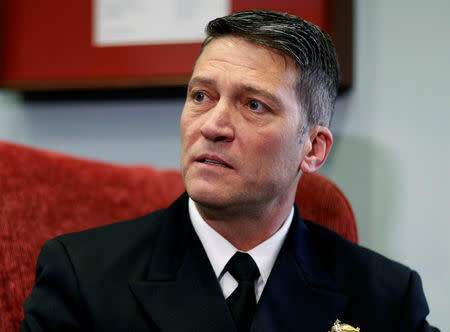 WASHINGTON (Reuters) - U.S. President Donald Trump's physician Ronny Jackson on Thursday withdrew from consideration to head the Veterans Affairs department after allegations that he had been lax with prescription drugs and drank alcohol on the job. The allegations, which Jackson categorically denied as false, had prompted the Senate to put a hold on his hearing for the job of leading the federal government's second largest department. The upset was the latest chaotic personnel decision to rock Trump's White House, which has been roiled by an unusually high number of firings and resignations. During his campaign, Trump had pledged to clean up the VA, which oversees healthcare and benefits for about 20 million military veterans, a constituency with considerable political clout. The agency has long been criticized for the quality of its care and the red tape that veterans encounter. Trump fired his first secretary, David Shulkin, in March after concerns about unauthorized travel expenses. Jackson, 50, was a surprising pick for the job, and even Trump acknowledged he lacked experience running large organizations. House Speaker Paul Ryan said the allegations warranted further review. "Whether or not there's merit to these allegations, we should find if there's merit to these allegations, and if there are, then the proper oversight should be done," Ryan, a Republican, told reporters. On Thursday, Trump lashed out about the uproar in a phone interview with Fox News, blaming Democrats who had compiled a list of complaints about Jackson from military medical officials who had worked with him. "He would have done a great job," Trump said of Jackson. "These are all false accusations. They're trying to destroy a man." Trump singled out Senator Jon Tester, the top-ranking Democrat on the Senate Veterans' Affairs committee, who is up for re-election in November in Montana, saying Tester "has to have a big price to pay in Montana." Trump, who was set to host a group of veterans at the White House on Thursday, said he has a new candidate with "political capabilities" for the job but did not announce his pick. Jackson is a U.S. Navy rear admiral who has been physician to three presidents. Democrats said more than 20 people, whose names they withheld, said Jackson had prescribed himself medications, got drunk at a Secret Service party, wrecked a government vehicle and once could not be reached on a work trip to provide medical treatment because he was passed out drunk in a hotel room. Tester had said Jackson's nickname was "the candyman" because of his willingness to hand out prescription drugs. He urged Congress to continue its investigation into the White House medical office. Presidential press secretary Sarah Sanders said Jackson was on the job at the White House on Thursday but White House officials declined to immediately make clear whether he would remain as the top White House physician. Senate Democratic leader Chuck Schumer blamed the White House for being "sloppy and careless" in vetting its candidate, and said senators were obligated to pursue the complaints from military officials. One veterans' group, Concerned Veterans for America, said in a statement that the White House should take its time to vet a new nominee for the VA job. Jackson has worked as a presidential physician since the George W. Bush administration and has been the lead doctor for Trump as well as former President Barack Obama. He is well-liked by both Republican and Democratic administration officials. "The allegations against me are completely false and fabricated," Jackson said in a statement on Thursday. "Unfortunately, because of how Washington works, these false allegations have become a distraction for this president and the important issue we must be addressing - how we give the best care to our nation’s heroes," Jackson said. The Iraq war veteran took on a higher profile when he gave a long and glowing account of Trump's health at news conference in January after his first presidential medical exam, saying Trump had "incredibly good genes." Jackson's qualifications to lead the sprawling Veterans Affairs department were questioned from the time Trump nominated him in late March. The agency has 350,000 employees and runs 1,700 facilities that serve more than 9 million veterans a year.